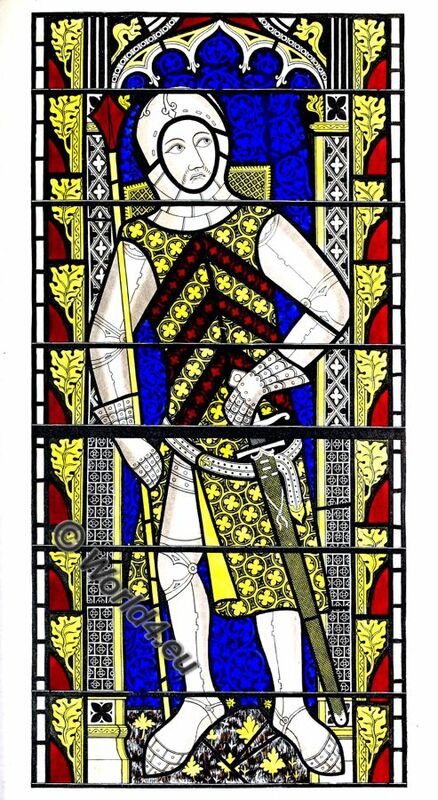 OUR Engraving is taken from a series of figures in the painted glass of the windows of the abbey church of Tewkesbury, representing different members of the noble family of Clare, who were patrons of that monastic establishment. All the Earls of Gloucester of this family were more or less eminent for the parts which they acted in the troubled events of the times in which they lived. The earlier members of the house were distinguished by their activity in the border wars against the Welsh. Gilbert de Clare, the 5th Earl of Gloucester of the name, was one of the principal barons who took up arms against King John, and was one of the twenty-five appointed to enforce the observance of the Great Charter. After John’s death, he remained staunch to the cause, till he was taken prisoner at Lincoln, while fighting under the baronial banner. His son Richard de Clare was also a firm supporter of the Magna Charta, and a staunch adherent to the cause of the barons. 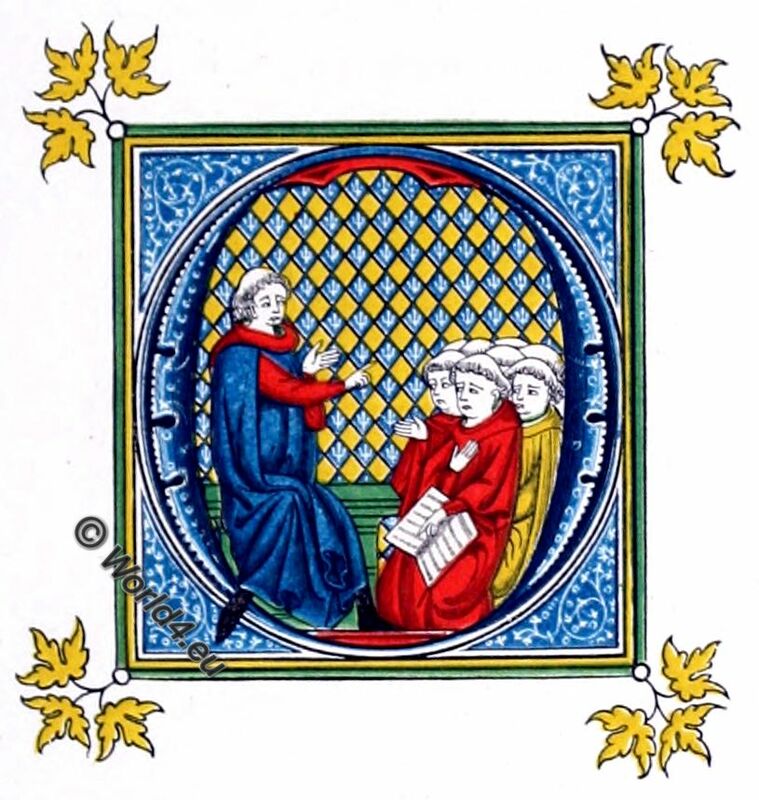 He died by poison in 1262, and was succeeded by his son Gilbert de Clare, the most celebrated personage of the family. He was at first an extremely zealous partizan of Simon de Montfort, and acted a very distinguished part at the battle of Lewes, where the king and prince Edward fell into the power of the victorious barons. After that battle, he became jealous of the power and influence of Simon de Montfort, and went over to the party of the king. His desertion of the cause, and his activity among the royalists, mainly brought on the disaster at Evesham, in which battle he commanded a division of the King’s army. “Sire Hue le fer, ly Despencer, tresnoble justice, Ore est a tort lyvré a mort, a trop male guise. Sire Henri, pur veir le dy, fitz le cuens de Leycestre, Autres assez, come vus orrez, par le cuens de Gloucestre.” Wright’s Political Songs, p. 126. He afterwards returned during a short time to the cause of his old confederates, but he remained unshaken in his fidelity to the crown through the reign of Edward I. This Gilbert, as it has been just observed, was the last of the male line of the Clares Earls of Gloucester; but he had three sisters, the descendents of one of whom intermarried with the royal line of the Plantagenets, and through them was derived the claims of the house of York to the throne of England. 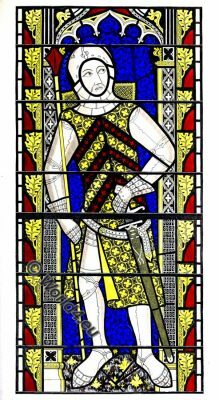 The windows were probably executed not many years after the death of Gilbert de Clare on the field of Bannockburn, and our engraving may be considered as a good and authentic example of the armour of that period, or of the beginning of the reign of Edward III. The Initial Letter on the preceding page is taken from a fine Manuscript in the British Museum (MS. Burney, No. 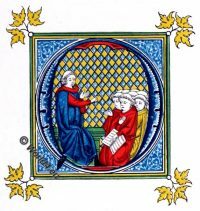 275), written and illuminated in the fourteenth century, and further described in our account of the Triumphal Chair of Don Martin of Arragon. It represents a school, and is curious as a specimen of the costume of children in the fourteenth century.